This marinated kale salad is about as good and easy as it gets. Unlike normal salads that don’t sit well after being dressed, this one only gets better. Since it can be made ahead it’s perfect for a potluck, picnic, dinner party, or to take for lunch. The parmesan can be omitted, but makes it feel a bit like a kale Caesar salad, which I greatly enjoyed. Make this salad at least an hour ahead to give the kale time to relax and absorb all the great flavors. Whisk together the lemon juice, olive oil, and mustard in a salad bowl. Season with salt and pepper. Add the kale and toss with your hands, massaging the vinaigrette into the kale. Add the parmesan and toss to fully mis it in. You can serve the salad immediately, but it's even better if you let it marinate (keep it in a container in the refrigerator) for at least a few hours. Gluten free, Kosher dairy, Vegetarian Parve and vegan if you omit the cheese. Love the idea of kale in a salad. I have to admit I have ever only cooked it because it seemed too tough for salad, but marinating it ahead is brilliant. I will definitely give it a try. And thanks for hosting the blog hop! I’ve never eaten kale in a salad…you’ve inspired me, Katherine!!! Kale salads are wonderful and I love the dijon and Parmesan that you put on there! Looks awesome! Your salad looks amazing! I love leafy green and kale is my favorite! I put up my “Ingredient 911: Kale” which discusses all the amazing nutritional benefits of this wondrous green. The post also includes a very basic kale chip recipe. Thanks for aways choosing such great themes! I use kale for smoothies or for chips.In Tel Aviv you can find it quite easily if you know where it is sold. Really Yael?! Where? I’ve heard that kale here isn’t what we think of as kale in the US, but I love all leafy greens so I’ll probably be happy 🙂 What is it called in Hebrew? Ooh thanks Yael! I’ll have to look out for it. Kale is also called kale in Hebrew! People say it more like “keyl.” It might have a true Hebrew name as well, but the sellers I’ve come across call it kale. I find it pretty regularly at shuk hanamal in Tel Aviv, and they also sell collards. I also came across a neat organic farm/sustainable community called “Adam ve’Chava” when I got lost on a bike trip about a year ago, and they were growing kale and other cool vegetables. I don’t remember exactly where the farm is since we were lost, but it’s somewhere between Tel Aviv and Jerusalem! Good luck in your search. Isn’t it exciting to find hard-to-come-by ingredients here in Israel? Limes! Samphire greens! Raspberries! I’m still on the lookout for rhubarb, though. I just discovered your blog and am having a wonderful time reading. I’ll be back! Cool, thanks Eleanore! Good to know – will have to head over there soon to check it out. This time of year I juice a ton of limes and freeze the juice in ice cube trays to I can enjoy it year round. I’ve found rhubarb a number of times at shuk hacarmel and even sometimes at supersol. I also freeze lime juice in ice cube trays. Tedious, but worth it! I also zest the limes and freeze tablespoons of zest in little plastic wrap packets sealed inside a zipper bag. Not a perfect solution, but much better than having no lime zest at all. At what time of year did you find the rhubarb? Is it a spring vegetable here, too? I believe last year I found rhubarb in winter, before the February strawberry season. I froze that too so I’d have it when strawberries came around! I love kale and lacinato kale is my favorite as well. The marinated kale salad looks wonderful! I do not eat enough kale this is a great recipe! I usually cook kale rather than include it in a salad. I don’t know why – in years past I used to use Swiss chard in salads all the time, and they are somewhat similar. Although come to think of it, I haven’t used Swiss chard in a salad in years, either! Gee, we get into ruts sometimes, don’t we? Good post – thanks. Massaged Dino Kale has become our favorite salad! When I first saw it a couple of years on Aarti’s Party I gave it a try and it was love at first bite. Since then I’ve been playing around with all sorts of combinations. I’ve linked up one of my favorites. I haven’t had it as simple as yours with just a little Parmesan, so I’ll have to give it a try. What a great hop for this time of year! Thanks for hosting! We have got so much Kale in our CSA box I haven’t known what to do with it all..and frankly, I’m a little sick of it. Excited to try this! I love, love, love kale! Your kale salad sounds amazing … and I think it’s going to make an appearance on our dinner table next week! Thanks as always for a great recipe and a great blog hop … I linked up my baby kale pesto! Hi Katherine! As always, thanks for hosting. Enjoy your Labor Day weekend! This salad looks delicious. 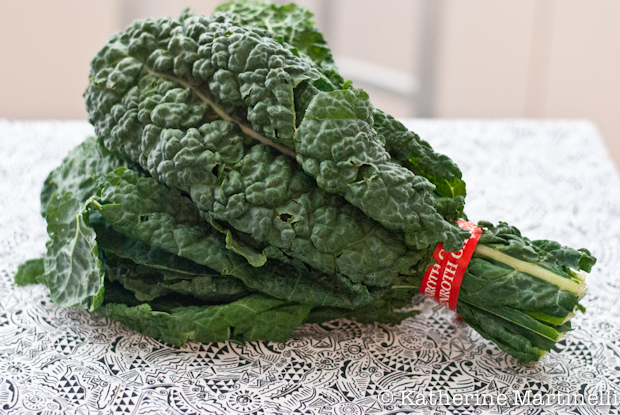 I make tons of salads but I never have done kale – it looks like this lacinato kale is especially suited for salads. Your pictures are beautiful! Wow, loving the theme of this hop! And how funny, my kale wraps use the same technique of dressing the kale early so it softens up a bit. Will have to try adding parmesan, because I love caesar salads – great idea! Yum! I love cavolo nero, especially in soups! I too have grown to like leafy vegetables at an older age… I guess that’s normal! hehehe Yummy salad! 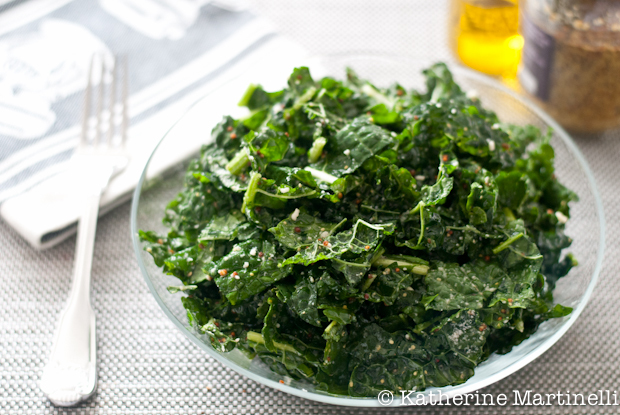 I was amazed the first time I made a salad with kale (and made kale chips, of course!) Didn’t know what I was missing. Now I’ve grown bunches and bunches of it in my garden. I have never tried kale in salads….it looks lovely with wholegrain mustard and hard cheese. LOVE this blog hop, Katherine! I am such a fan of kale and I can’t wait to check out all the links. Your salad looks divine and like something I could eat everyday. We may not be able to grow tomatoes well here in Seattle, but we have an abundance of kale! I need to give this salad a try. I love kale and use it a lot in clear soups. Wow, what an incredible resource for greens recipes! Love this roundup. We will be in the kitchen for weeks! We’re going to feature this on our Facebook page and link here so people can see how you made it, and your lovely photography. If you wish, come LIKE us on Facebook for more recipes and tips on greens like kale, chard, beet, mustard, turnip, collard, escarole, dandelion and other green leafies.